I was not there, but to appease the rants of our local blog enforcer-in-chief, this humble reporter will relate a probably distorted diatribe from last night's pilot debriefing. I've heard tell of the mysterious rarely flown Makua site, and have wanted to try it for myself for quite some time. A cursory look at the blipmap and the forecasts made it seem like that this might finally be the day Makua would be working on a weekend. I mentally prepped for a chance to try this elusive spot while puttering around the house. Alex posted that his crew was getting a slow start but had an ETA of 12:30-1. I missed that last part, and focused on the more comforting report of a slow start and continued with my household chores. On more study (i.e., staring at the computer screen for many minutes over and over again), one can see that the west flow depicted heading straight toward the west side of the island takes a northward turn just as it gets close, becoming a southerly flow which Alex has cautioned doesn't work for Makua. As it turns out, the crew once at Makua found too much south in the flow, and opted, rather than gamble on it switching around, to repeat their expedition of the previous day to the "End of the World" -- hiking toward Kaena Point, and perhaps the chance to find or create a better launch there than what they had on the previous day. At 2 pm, realizing I had missed the boat to Makua, I called Alex to see if it would be worth paddling over on my own. 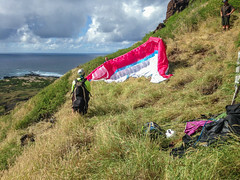 No, he reported, they had given up on Makua, and that after a two-mile hike, they were then in the midst of grooming a new launch. From my debriefings at the party last night, I learned that the new launch was fruitful for Duck and Drew as they were able to launch and soar above from Kaena down to Maili and back to the cars! For the remainders, however, the wind had begun to shift, gaining a more northerly component, forcing them to abandon the newly coiffed launch and forge further north on the range. They had to hike all the way to the point as the wind was now splitting the spine at the end of our world, flowing down both sides of the range. Alex settled on a launch lower down while Woody pressed on higher to a postage stamp of a launch with better odds for getting and staying up. With the wind splitting the point the lift band was narrow and weak. As Alex's chat post indicates, his flight was a short scratchy sledder leaving him a decent hike back to the car. Woody's extra hiking upward paid off and he was able to make his way further up the narrow point with the aid of some thermals, sharing the thin space with Cade. with the flow trending more northerly, the spectre of rotor was very real and Woody chose to get away before conditions deteriorated further with a line down the coast away from the ridge. This line, however, was a thief that quickly stole his hard won altitude. Those watching said he sank like a stone as soon as he left the ridge. He, too, was left with a healthy hike back to the cars. Becca followed Cade in the air, and as they prepared to leave the point, he advised her something to the tune of "Don't follow the old man". Ha! perhaps good advice on this particular occasion, but those youngsters should be pleased should they attain his years with as much energy, agility, ability and wisdom. I'd follow Woody if I could! The two reportedly hugged the ridge *very* tightly on a bumpy ride back toward the cars. I heard there was another visiting pilot that ventured round the Dillingham side, landing there leaving his family driver with the long scenic cross-island retrieve tour. Apologies that I don't have a full roll-call. I leave this framework of a tale here to be freely edited and corrected while I get my gear and go to whereever today's blipmap leads me. Ok, OK, Ok, OK I just walked into the office, found JJJ on the floor screaming Oh God, Oh God, Oh God. I was not sure if he overdosed on Viagra or was having a heart attack. I looked up at the computer and there was this story. He regained his composure and exclaimed....."We have a reporter, a real reporter, Parker your Fired!!!! He then sat back, eyes still glazed and politely asked me to pour him a wine. JJ Jameson smiled. Thanks Sandy June aka Sporty Spice, I will have a less conflicted evening with my crass, demanding room mate. Although, you have appeased him this time, you may have opened pandoras box, as he will be hounding you to stroke the keys more often. For me it will be worth one night of peace but I am praying for more. Great read!! It's Time to Fly, Get Sandy Some Gear and Let Her Go !!!! Thanks for cobbling together a story from the confusing reports we gave you last night! I think you pretty much nailed it. I added the one picture I took, of Drew launching, while Woody and Duck hold up his wing. I would love to see any pictures Duck took as he flew to Maili Point and back. I also look forward to seeing that track log!